Defeating 4A Sierra Vista on Tuesday with a team score of 51-22, Boulder City High School wrestling team was at its best coming out of the holiday break. Bryce Rogers/Boulder City Review Boulder City High School junior Ryan Vanario won his match by pin fall during the Eagles wrestling match against Sierra Vista on Tuesday. Already beating five 4A programs this season — Coronado, Desert Oasis, Liberty, Sierra Vista and Valley — the Eagles have shown they’re not only willing to wrestle against anyone, but are capable of beating anyone put in front of them. Certainly buying into that approach, six Eagles earned pin falls Tuesday, highlighted by sophomore 113-pounder wrestler Curtis Brown, who picked up the fastest win of the night with a 42-second pin against Sierra Vista junior James Weaver. 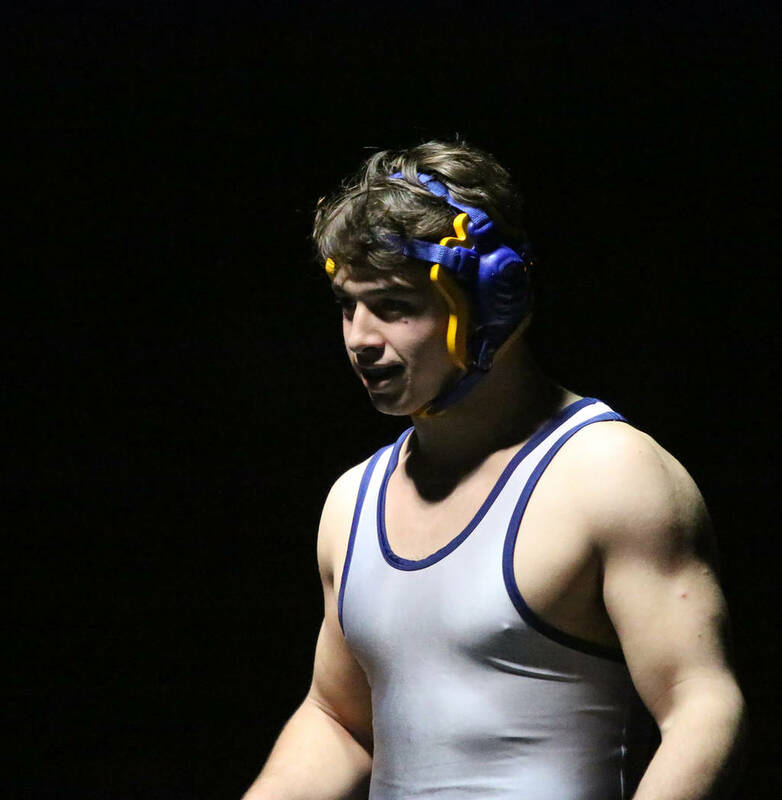 Picking up pin falls as well for the Eagles were senior 126-pound wrestler Garrett Leavitt (5:52), junior 160-pound Jimmy Dunagan (1:13), junior 195-pound James Ewell (3:24), junior 220-pound Ryan Vanario (1:52) and sophomore Aiden Fradella (1:11). Claiming a decision victory, senior 132-pounder D.J. Reese picked up a 14-8 win over Akram Zerhouni, while junior 145-pound Hayden Moore (7-2) and sophomore 152-pound Ladd Cox (5-0) won on decisions as well. The Eagles will travel to Delta, Utah, this Friday for the highly competitive Delta Duals, before returning home to host rival Virgin Valley on Wednesday. Friday and Saturday, Jan. 12 and 13, Delta Duals in Delta, Utah, 3 p.m.
Wednesday, Jan. 17, vs. Virgin Valley, 6 p.m.